“Edge of Tomorrow” – Sacrifice, Brutality, and Choice | J.W. 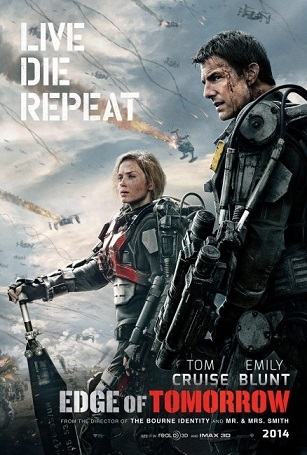 Wartick -"Always Have a Reason"
I had the chance to watch “Edge of Tomorrow” this past weekend and I was surprised by how much I enjoyed the film. It was fantastic. Here, I’ll discuss several themes found in the movie from a worldview perspective. There will be SPOILERS in what follows. I will not summarize the plot, but a summary may be found here. Major William Cage (Tom Cruise was brilliantly cast for this role) is presented with a number of choices throughout the film, and it becomes clear that he is not a typical save-the-world type of hero. He is flawed, he has passions, he loses hope. But throughout these aspects of the film, we find the notion of choice. Will Cage has been given an extraordinary opportunity to impact the entire human race. When his blood is mingled with that of an Alpha, his death sets off the “Omega” which resets the day. Over and over again, Cage is faced with a choice: what do I do with this day? He finds Sergeant Rita Vrataski, who is one of the only people who also realizes what’s happening, though she herself doesn’t remember the days. The question, again, is what do I do with this day? Cage’s character is forced to consider that he has the ability to possibly save all of humanity. In such a situation, what choice does he have? But he does make some choices: he chooses to try to save Rita, to save others. But at other times, he gives in to frustration, allowing members of his squad to die despite being able to prevent it. Cage is not a knight in shining armor, but he confronts us with a human thrown into an impossible situation with the highest possible stakes. Placing the concept of choice against such a backdrop makes for good drama, but it also begs the question: what are you doing with your day? From a Christian perspective, the choices we make are extremely important–we are called to be witnesses, lights to the world–but do our choices each day reflect that? Do we, like Cage, sometimes allow injustices despite having to put forth just a little extra effort? How do our choices impact our life in Christ? The movie demands that we answer questions like these. Cage is also confronted with a kind of self-sacrifice. By admitting he is what he is, he must go through a cycle in which he dies continually, in often brutal ways, in order to try to improve, to save humanity. It is sacrifice, but a sacrifice knowing that he will be back the next day. One must ask, I think, whether that actually diminishes the sacrifice. I don’t think it does. Cage must steel himself each day knowing that death will come again, and again, and again. The only way to prevent it is to save all of humanity by destroying the Omega. Though, in the end, Cage ultimately does give up his life for humanity, only to be brought back by having his blood mingled with that of the Omega. One is left wondering whether he will retain the power or not. The self-sacrifice of Cage (and Rita) for the sake of humanity is clearly a theme which resonates with the central Christian teaching of Jesus Christ as crucified and resurrected Lord. However, beyond the obvious parallels of giving up life for the sake of all (and subsequent resurrection/awakening), the sacrifice of going in knowing one is to die is something that resonates with the story of Christ. I have sometimes seen a challenge issued theologically to the Christian teaching saying Jesus didn’t really sacrifice himself if he knew he was going to be risen by God. But of course that hardly destroys the notion of self-sacrifice and the real price paid of death. Being risen does not destroy the sacrifice of death. The theme is echoed throughout the film. It may cause one to wonder about the brutality of such a story and its appropriateness, but I think that from a Christian perspective one has to incorporate the rest of the themes found in the movie. The brutality of the cross is itself something from which people shy away, but set against the backdrop of salvation, brutality can become sanctified. I have not read the manga that “Edge of Tomorrow” was based on, “All You Need is Kill,” but I have heard that there is some juxtaposition over the primacy of the community vs. individual in either. “Edge of Tomorrow” shows this kind of valuation in many ways throughout the film. First, there is Cage’s continued efforts to save Rita, despite what it might cost–including going on one part of the mission alone in order to prevent her death. Second, there is the concept of both Cage and Rita valuing the community of humanity over the self by willingly spending all the time they have left trying to defend humanity rather than find a way to survive themselves. Finally, both Cage and Rita choose to place the community over the self when rather than trying to save one or the other, they both do what needs to be done and give themselves to save humanity. For Christians, themes of community and individual are extremely important. It is easy in the Western mindset to become obsessed with the self, but a true community of individuals exists in the body of Christ–each as important as the next. How do we go about living our lives in light of this truth? There are many other themes to be explored from “Edge of Tomorrow”- what of the Alpha/Omega? What happens to Cage and Rita after the end of the film? Were there any efforts to try to make peace or reach out to the “Mimics”–the aliens that they fight against throughout the movie? These are important themes, and I’d love to get discussion of those started in the comments. For now, it should be clear that the film has many themes to reflect upon and it is well-worth seeing. What did you think of the movie? What other themes have you thought of in relation to it? Let’s get your thoughts in the comments below! All You Need Is Kill/Edge of Tomorrow– “Edge of Tomorrow” is based upon this graphic novel. Check out Anthony Weber’s excellent review and critique of the graphic novel from a Christian perspective. I really recommend you follow his blog as well. It’s in my top five must-read blogs, and it is worth your time to browse at length. Yes, I thought the character underwent a dramatic change, but in a believable and developmental way throughout the movie. It was just a really fantastic flick. Thanks for dropping by! I don’t know how as a Christian you could miss the fact that the beasts in the film are called Alpha and Omega with which God calls Himself. To me the film is an insult to God. Glorifying mankind against God that despite men’s weaknesses he could defeat the awful God when in reality men are weak and helpless and that God is not an angry God but a loving and mighty One as well as a just God who will reward the repentant ones and punish the the bad ones. Right, but Alpha and Omega are also Greek letters often used to signify a series, so I am surprised by your tone.